Vancouver Sprint Camp 2013 and The Home Field "Advantage"
The Vancouver Sprint Camp is the biggest event of the year for my club, GVOC. And I had been looking forward to it for quite some time, though unfortunately for me this was only my second Sprint Camp! I had run on all but one of the maps before, and was hoping that this would help my chances in the new system of having an overall winner for the weekend. Top 5 in men's and women's were to be awarded a prize based on percent behind the winner in 5 of 6 SI timed races. Because of this the weekend turned into a bit more of a racing camp than a training camp though not in a negative way. So how helpful was the home field advantage? I would say it cost me more time than it saved! in several races I said to myself "I know where that is!" and took off running. Though because I didn't completely analyze the map and realize that although, yes I new where the location was, I hadn't chosen the best way to get there. 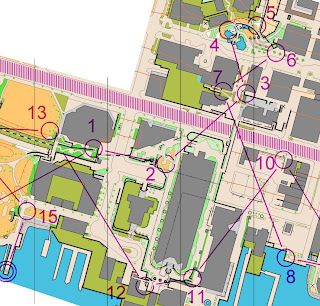 My best example of this would be my control 18 on the Setup Race at Queen Elizabeth Park. For this leg I simply glanced at the map said "Perfect, I just have to cross the small rock bridge (Circled above in Blue) and I'm there" So I put my head down and ran right to the bigger rock bridge (Circled in red). Because I thought I remembered the other bridge being wood I lost a solid 45 seconds looking in the wrong patch of trees. When all along instead of trying to remember what the park was like, I really should have just read the map. Overall for the weekend I wish I had forgotten all the locations and simply used the map. Knowing Lonsdale Quay might have saved me some time but even here I made assumptions that I know lost me some time on the complicated multi-level sections. Moral of the story - No matter how well you know or think you know an area remember that the actual answers are in your hand! Nevertheless Sprint Camp was an awesome weekend. With a verity of maps, forest, urban, and park, and lots of new challenges; especially multi-level areas like Lonsdale Quay! Even if it was a bit of a race weekend for me there was lots of fun to be had for everyone with the banquets, costume contest, and fun events. 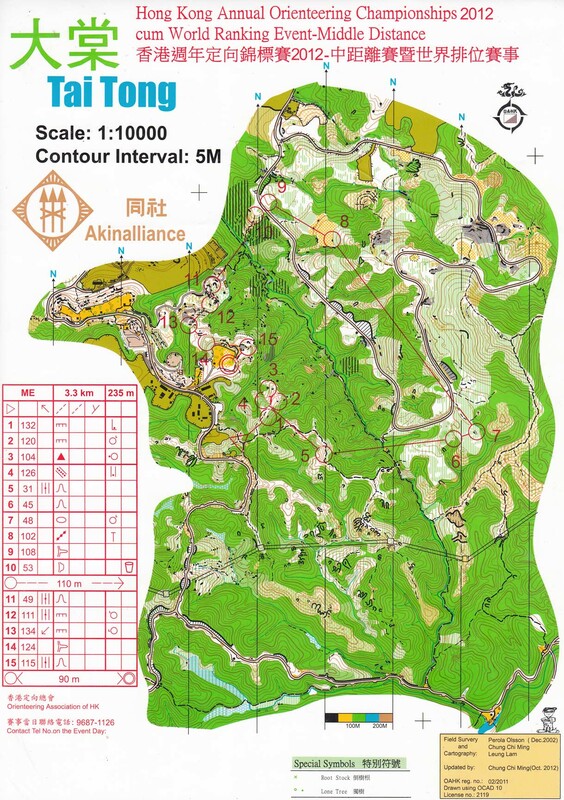 Hong Kong Orienteering: Why haven't you been yet? Much has been said about last month's World Cups in New Zealand, which were attended by many. Unfortunately, the races held in Hong Kong one short week before said World Cups were attended by much fewer. Since so much has been said about New Zealand already (yes, it was excellent, read any number of the other blog posts at worldofo.com about them), I wanted to, albeit belatedly, write a bit about of my experience orienteering in Hong Kong. First off, to get it out of the way, I will grant that the terrain in Hong Kong will not blow your mind. You will find very little pristine white forest one might expect in Scandanavia. There is quite a lot of very thick green and very thick green. With that admission out of the way, I would also argue that if you don't make an effort to go to Hong Kong for orienteering, you're missing out. There is still plenty of maps that have some white forest, some slower green, lots of vast open rocky hillsides, complex urban areas, and extensive trail networks for tough route choice decisions. Not only that, but you're missing out on meeting what I would consider the best orienteering community I've ever encountered. When I first arrived, I went on a mission to get myself a Chinese Visa. One day later was a race in China, and the Hong Kong association arranged buses for any interested runners to make the three hour trek into Guangdong province to attend. They had three full buses. The race itself was a modestly important race to the Chinese, but was planned by an orienteer from Hong Kong. The map was made less than a month prior to the event happening, the courses with even less time. Nevertheless, the event was (presumably) a success, and we even stopped for Strawberries on the way home. They have a certain pluck and moxie to make these events happen. Once back in Hong Kong, I participated in the Hong Kong Sprint, Middle, and Long championships. In all cases, the races were very well organized, and utilized the limited terrain impressively well. The middle, for example, was drowning in green, save for ribbons of white forest and trails. So, the middle was planned to be a) epically physically difficult, b) with some longer, route-choice-y legs, and c) tricky in the few white areas. And once again I want to re-iterate, that, while it may not always be the 'best' terrain, its that its so different that makes it so pleasant. Its what I've repeatedly harped on about China as well. Its may be forest, or park, or urban orienteering, just like we have anywhere else, but its different. It feels different, the forest is different, the character of the terrain is different, this sort of adventure cures your orienteering blues. There's orienteering in them thar hills. Seriously. To top it all off, this orienteering is done with the most cheerful group of people I've ever met, and a major part of what made Hong Kong really shine. 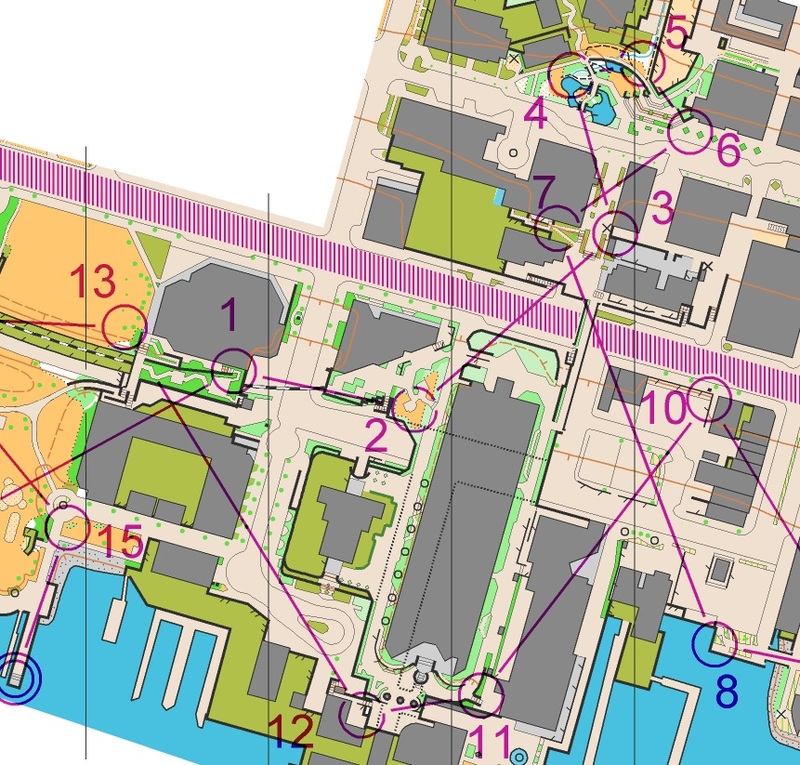 The people that compete at these events don't necessarily all do it to compete exclusive in orienteering, but because they love competing, period. And adventure. And giving it their all in sport, whether it be orienteering one weekend, cycling the next, epic 50km trail runs the weekend after, followed by a triathlon. And they love to do it together, as a sporting activity, and a social activity. Every event I did while there was followed up by a fun and delicious lunch/dinner before heading their separate ways, until next time, which was usually Tuesday night training, or Wednesday night hills, or the next weekend's event. And they even let big dumb non-Cantonese speaking me come along. It was particularly cool to meet all these people because quite a few of them had already been to Edmonton back in the days of APOC. They've made the effort to come to us. They deserve a similar effort from us. After the long distance - roasting slabs of meat over a fire? Yes please. Some of the crew after our evening hill run in front of what is probably the world's finest urban night scape. I'm no graphic designer, but I love this. 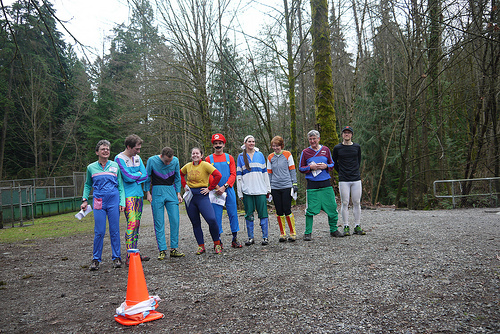 In conclusion, I would argue that those people who are really passionate about orienteering are the ones that don't always look exclusive for events that have the best terrain, but rather search for events that offer the best orienteering experience. And when you combine the excitement of a city like Hong Kong, the amazing community, and the adventure of exploring some new and weird terrain, you really can't go wrong for an amazing trip. Thanks to awesome hosts Gerald and Iris also! Bad news, I enjoyed myself enough that I'll probably be back. 2013 High Performance Program Athletes Announced! You can view individual athlete profiles (updated for 2013) here. 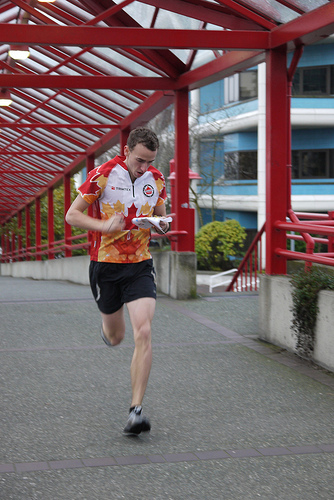 You can also follow the athletes on the Team Canada Blog, on Facebook, and on Twitter@OrienteeringCAN. Please feel free to add comments of congratulations and encouragement to our athletes on any one of these pages!